This month I'm exploring the wines of Liguria, and first up is a fairly pricey bottling of Pigato that I purchased at the Los Angeles Italian wine mecca, Wine Expo. Ligurian wine--and Pigato in particular--is pretty rare in American wine shops. This is a shame, because Pigato is an intriguing grape, and you once you've tasted it you won't mistake it for something else. The grape has a blotchy, speckled appearance and makes wines that are aromatic and have a distinctive, salty tang to them that reminds me of the seaside. My Pigato cost $25.99, and for that price I expected it to be memorable. However, I didn't check the vintage (when will I EVER learn to do this, especially with Italian whites, which tend to linger on wine store shelves?) and it turned out that the bottle was from the 2005 vintage and probably two years past peak drinking. You can get a more recent vintage for less money in the market now, and if you can I'd recommend giving this variety a try. 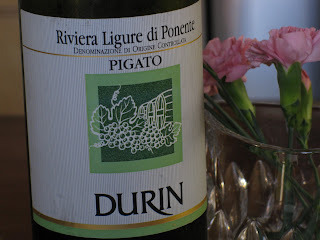 The 2005 Durin Pigato Riviera Ligure di Ponente may be at the end of its life, but it's aging gracefully and still exhibits what I love most about Pigato: the blend of saltiness and citrus that reminds me of a briny preserved lemon. Given its age, the wine was a bit waxy and honeyed in its aromas and flavors, but I still found that combination of lemon pith and saltiness refreshing and it just made it into the good QPR category. However, had the wine been younger and fresher I suspect I would have been more impressed. Pigato is great with seafood--that's the classic pairing that everyone will mention--but don't underestimate how good it is with pesto. If you've got access to a bumper crop of the herb, whether from your own garden or the farmer's market, whip up some pesto, cook some linguine, toss the two together and chill down your Pigato. The saline tang of the wine is marvelous with the herbaceous salinity of homemade pesto. I love the saltiness in wines, it gives them such character and savoriness. Ansonica is another interesting varietal with some saltiness. I have to see if I can find Pigato in Florence. I am loving Pigato. I think that Liguria will grow a lot in quality. I love these from liguria with a Cuban cigars from Cigars Online.I wish they were easier to find in US as Cubans Cigars Online.You guys must try it out with a Cuban.